Here is my first unit of Redcoats finished. I am very happy with the finished result. Apart from the two casualties, who are from Offensive Miniatures, the Company is made up of Foundry figures (sculpted by the Perrys). The bases are from 4Ground drilled and fitted with neodymium magnets. The movement tray I made. Standards are by GMB Designs. Another four Companies to go, two Highland Flank Companies, a Company of Portuguese Foot, three Companies of Cavalry and two Artillery. The wife is away cheffing at The Taste of London festival so painting time has been reduced this week. However I am using what time I have by making more Napoleonic movement trays. I’ll post how I make them, it is a fairly simple job. This is the next job on the workbench, or rather the kitchen table. 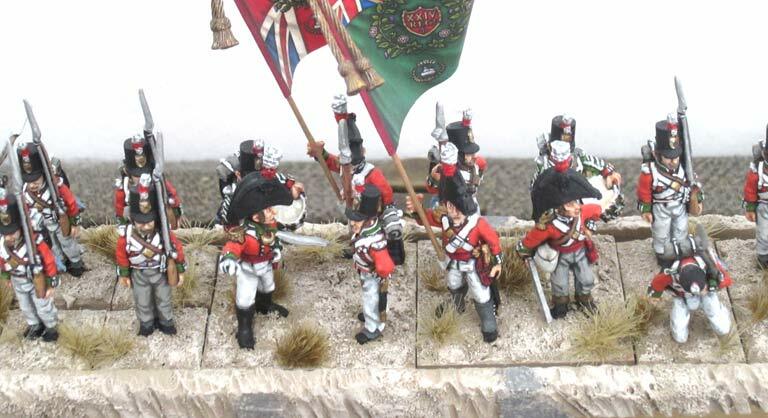 A unit of the 95th Rifles for my Black Powder British Peninsular Napoleonic Army. Most are by Foundry (thanks CSM) and there are a couple of Perry plastics in the mix as well. Everytime I finish something now I put away the paints, clean brushes, new paper towels, basically a clean slate. I’ll post a picture of the command group that has just been finished later this month. Next project on the workbench. A command group for my British Peninsular Napoleonic army. I have been prevaricating about starting this project as Napoleonic wargamers have a reputation of being very picky about accuracy. If I can do my Napoleonics well and get some praise for them I reckon that I can consider myself an OK painter.